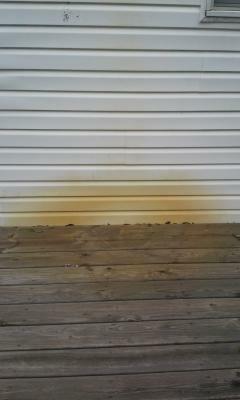 Cleaning Rust Stains From Vinyl Siding - Jackson NJ This is a picture of rust stains cleaned by BlueJet Power Wash in Jackson NJ. These orange looking stains are also called "irrigation stains", since they are usually cause by your irrigation system (sprinklers). Depending on your locale, your water may have minerals in it that will stain any surface it lands on. 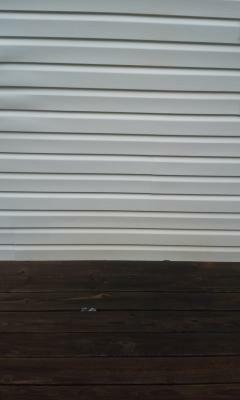 Cleaning rust stains from vinyl siding is not simply about power washing, as soap and water wil not take out these stains. You will need to find a power washing company that specializes in stain removal, and who is trained to safely use the chemicals necessary to remove these type of stains. Cleaning rust stains from your vinyl siding Jackson NJ can restore your siding to look like new without any damage to your home, however it is recommended to first change the direction of your sprinklers so the problem does not come back. Copyrights © . BlueJet Power Wash. All rights reserved.